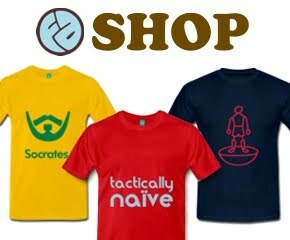 For a kit to become ingrained in the collective consciousness usually requires a team to perform laudable exploits while wearing it; win a major trophy, secure promotion, or at least embark upon a plucky cup run. Not so with Hull City’s 1992/93 home kit, worn during a season of abject failure: The Tigers narrowly escaped relegation from the third tier of English football, exited the League Cup at the first hurdle, and bested only Darlington in the FA Cup before going out in the Second Round. It is purely the design that secured this kit’s enduring infamy, which is an impressive feat considering the era, when outrageous designs were legion. Clubs had cottoned on to the money-making potential of polyester replicas released annually rather that every two years, suppliers were pushing design boundaries to show off new printing techniques and a rash of small kit-making firms were keen to make a name for themselves, culminating in an imperfect storm regarding kit design. But whereas most of the, ahem, attention-arresting designs released during that period were used for away kits, it was Hull City’s home kit that would be quite literally wild. 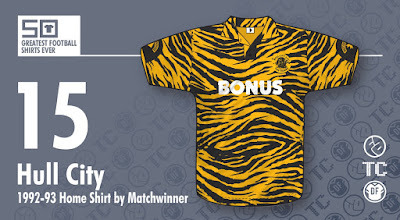 Scottish brand Matchwinner looked to the club’s nickname for inspiration, producing a lurid tiger stripe print shirt, paired with black shorts and socks with amber trim. 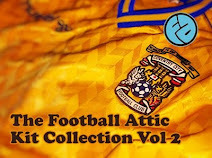 Near universally mocked outside of East Yorkshire, this shirt is fondly recalled by many Hull City fans, who revel in the kitsch value and remember the media hoopla generated as a rare bright spot in an otherwise bleak decade. Those who claim this to be among the worst kits ever are seemingly ignorant of its successor, which was essentially a knock-off. 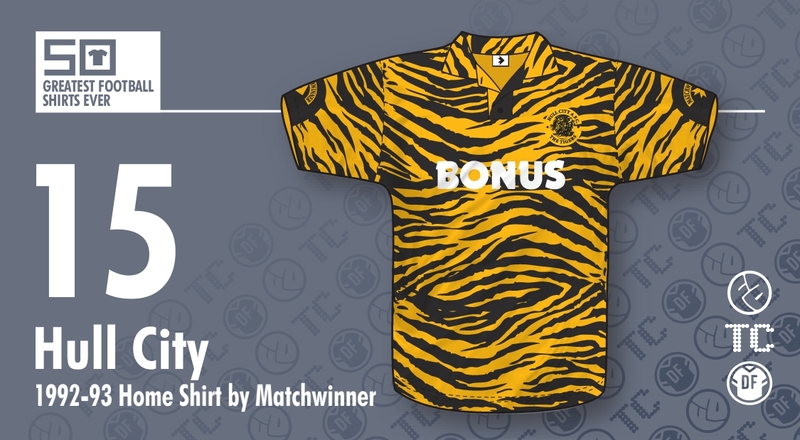 The five-year relationship between Hull City and Matchwinner came to a sudden and acrimonious end in the summer of 1993, giving replacement supplier Pelada no time to design a non-copyright violating approximation of the tiger-skin print shirt. So The Tigers began 1993/94 with the previous season’s shirt and shorts (Pelada supplied new socks) with Matchwinner’s logos patched over, it wasn't until the November when City wore Pelada-made home shirts for the first time. Only the ‘tiger skin’ looked more like a leopard print, and featured such a tightly compacted design that from a distance the shirt looked a rusty hue, rather than our usual distinctive and bright amber. Indeed when Oxford visited Boothferry Park they were permitted to wear their yellow primary shirt, deeming it not a clash with our supposedly amber and black shirt. 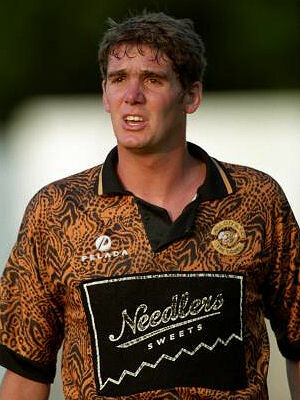 It was so bad that even fans who loathed the original tiger print shirt will have pined for it after seeing the shockingly bad substitute. The original might have been ill advised (and the concept is certainly best left in the past), but it was fun and generated more publicity than a side ranked 20th in Division Two of the Barclays League warranted. To this day it remains memorable and iconic. Our grateful thanks to Les. 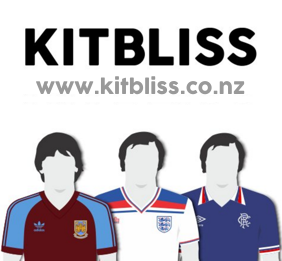 He can be followed on Twitter here and his website, HullCityKits.co.uk, has much more in the way of kit imagery and information for those of you interested in what The Tigers wore in days gone by. That's just gross. Awful kit.